Editor’s note: At our Philly Bike Expo booth, Philly Pedals offered an idea board where guests could write down what they would like to see on the site. One of the more popular demands was information about bike rides. Some were interested in finding new routes they could follow, while others wanted to know about planned rides. We thank you for letting us know what you would like to see: You’ll find it on Philly Pedals. 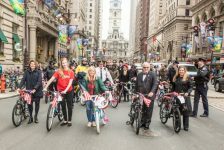 Here, Alex LaBant, one of the organizer’s of Philly’s Full Moon Bike Ride tells us how the ride, making its eighth monthly appearance on Sunday, November 17, got started. October Full Moon Bike followers stop to look at the ride’s inspiration. Much like our ancestors before us, a group of Philadelphians closely follows the lunar patterns, assembling every month under the guise of the Philadelphia Full Moon Bike Ride. A recently new addition to Philly’s vibrant cycling scene, having started just over seven months ago, this loosely knit group comes together to share a mutual enjoyment for riding, howling, and hanging out in good company. The ride was started as a lamentation between friends, distraught that our city should pale in the shadow of others when we excel at so many other things. Thus, the Full Moon Bike Ride was born, pulling from best practices in other places such as Austin, TX, and Madison, WI, to create what we aspired to be the nation’s best. Very quickly the idea of competition was forgotten, as we realized how absolutely enjoyable the tradition was becoming without drawing parallels. 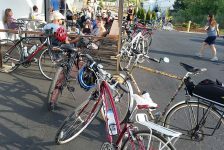 The route changes every month and generally features a scenic halfway point for a brief hangout before ending at a dive for some drafts. There a few, if any rules, apart from having a good time and leaving the pretense at home  or in Austin. Riders of all backgrounds are welcome to join. For questions, please check out the Facebook group.